Swing dance is a lively style of social dancing in which a dancer often lifts, spins and flips his or her partner. Considered both hip and cool, swing dancing is a favorite among social dancers of all ages. Swing Style: It's not difficult to spot swing dancers...look for the couple with the biggest smiles having the most fun. 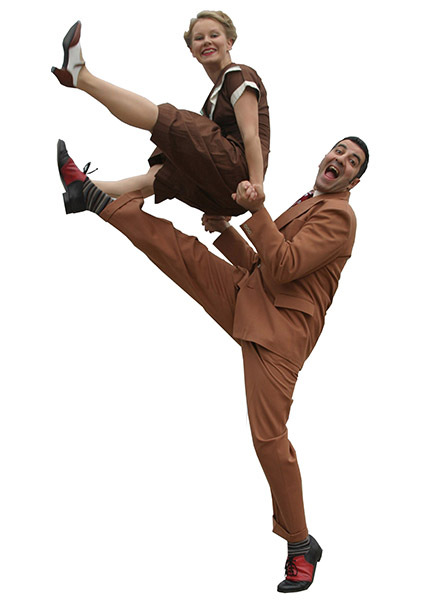 Swing dance is characterized by lots of swinging, flipping and throwing of dancers. Because it is a non-progressive dance style because it is mostly performed in one spot, it is a popular dance for a crowded dance floor. Swing is a quick, fast-paced dance. Couples hold hands as opposed to placing hands on the shoulders or around the waist, as ballroom dancers do. Swing dancing takes a little practice, but once you learn the steps, you may never want to stop swinging. Swing Dances: The term "swing" refers to a variety of unique partner dances including: Lindy Hop, West Coast Swing, East Coast Swing, Jive, Hustle, Jitterbug, and Shag. Swing Music: Many musicians say that there is no such thing as swing music, there is only music that "swings." Swing dance music is as varied as the many styles of swing dance. The development of swing dance styles was heavily influenced by the popular music of the time. Swing music may include styles such as jazz, hip-hop, blues, rock-n-roll, ragtime, R&B, funk and pop. The chosen music style typically determines which swing dance should be danced. Swing dancers enjoy dancing to many different rhythms, as slower beats allow them to have a break from the fast-paced swinging. Swing dancing is energetic and lots of fun, and a great way to meet people. One of the main reasons why swing dance is so much fun is because dancers have the chance to add their personal style and expression. If you attend swing classes, you will be taught basic steps and patterns, but your teacher will encourage you to add your own special touches. Get 2 private swing dance lessons for only $10! Singles or couples welcome. © 2015 All That Dance Studios in Louisville. Offering swing dance lessons Louisville KY. Try 2 private swing dance classes for only $10 and learn swing dancing in Louisville.